Being gluten free as well as unable to eat fat limits the sweet treats that I can indulge in. Whilst this is wonderfully healthy, I do crave the occasional sugary bite. I was entranced by these soft pillowy chewy treats called daifuku mochi when I first saw them and I was delighted to discover that they are naturally gluten free. I have found them in long life packs at our local Oriental ingredients store and whilst they taste delicious and are immediate, but that hasn't stopped me wanting to try to make them for myself. Handling the dough is a joy to anyone used to baking gluten free. 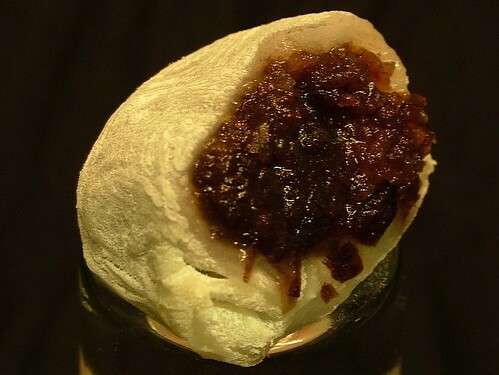 The warm translucent paste is stretchy and pliable in a way that most gluten free doughs never are. Stretching and pressing gently will allow you to create a thin sheet of dough which can then be cut to form the sweets, though I was very tempted to roll it up and start again, just for fun! 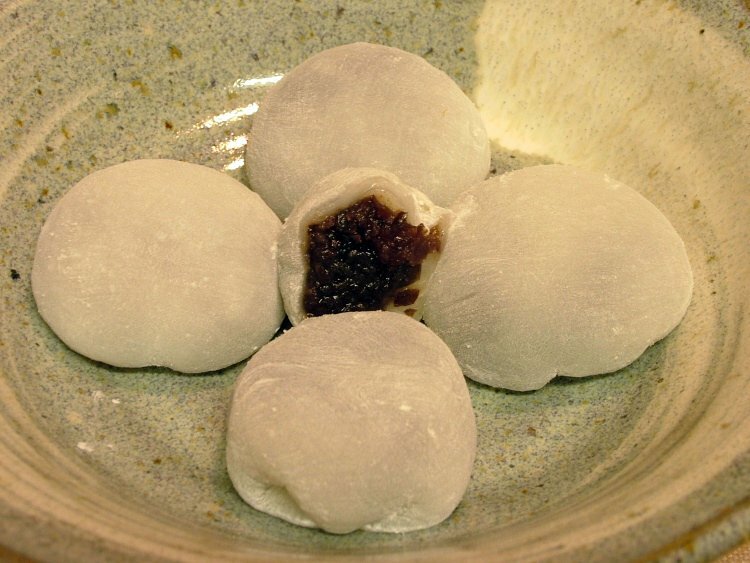 These daifuku are filled with anko, which is a thick sweetened puree of aduki beans. The teen loves them filled with sweetened peanut butter paste but my favourite is a thick spicy squash or pumpkin puree. I didn't have any pumpkin around, so went for the more traditional filling of aduki beans. This recipe makes 12-15 sweets. 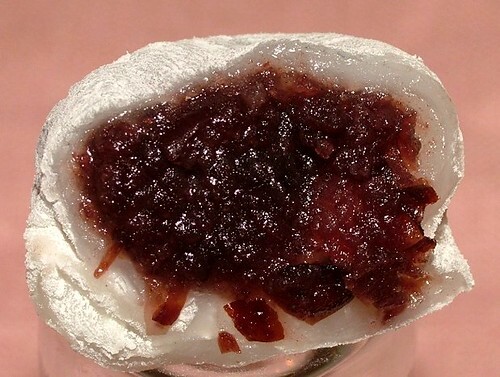 Making the sweets themselves took about 1 hour from beginning to washing up (using pre-cooked bean paste). The sweets can be stored covered for 24 hours before serving or frozen, so they could be made in advance to serve as desserts or sweets. I had wanted to take photos of the method but the whole process is both dusty and sticky that action photos were not possible, sorry! put the aduki beans in 1.5L of cold water and bring to the boil. let boil at a rolling boil for 10 minutes, then take off the heat. put a lid on the pan, and set aside for 6-8 hours or overnight. continue to cook, topping up with boiling water as necessary. allow the mixture to cook, stirring once or twice until it is thick and sticky (you may find you need to add a little more water to ensue the paste cooks to a translucent mass without a hint of powder remaining). scrape up the hot paste - it will look like a lump of gluey mashed potato, and completely un-usable, but don't worry, it's fine! press the dough out using your fingers / knuckles to create an even sheet about 4-5mm thick, this takes a little while but isn't that much different from pressing out a wheat dough for a pizza base. when you have created an even(ish) layer, cut out one piece at a time using a knife, pastry cutter or glass 6-7cm wide. If you use a knife and cut triangles you will have no wastage at all, otherwise there will be some trimmings. if you are left with some trimmings from the dough, you can re-roll and make some more. you will have to knead the dough a bit harder to bring it all together before you can press it out again and cut into pieces. 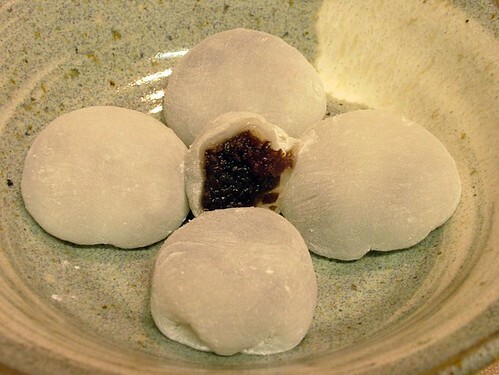 these last few daifuku mochi will have thicker sken and be a bit chewier - I actually preferred these to the rest I made! When you are clearing up, don't throw away the starch, pass it through a clean sieve to remove any pieces of dough then store for future use. And finally, don't throw any pieces of dough down the sink as it will solidify as it dries and block the drain. Put your utensils to soak then scrape the wet dough off into the bin instead. Well I have never seen these before! They look very intriguing I can't imagine what texture they have nor what they taste like. I will be keeping my eye out for these so that I can try them and the intrigue satiated. Thanks for these. ooooh...I love daifuku mochi. I love the very soft skin. Thanks for sharing how to make it. It looks simple. Mary, you are right - they are easy as long as you prepare in advance. I think that with a bit of experience you could make the skin softer by adding a bit more water. I started with a slightly chewy dough as it is a lot easier to handle when you are a beginner like me! Never heard of this before, interesting. They're called azuki beans, not aduki. Its pronounced "ahz-kee"